'Tomorrow's Residential and Daycare Services' is a multi-million pound programme to build five new care homes and four day care centres designed to meet the needs of older people and improve their quality of life. The new homes will be built around plans that help residents make the most of how they live and socialise. Each home will feature 120 en-suite bedrooms across 8 units with 15 residents accommodated in each of the units. The designs of the homes and day care centres are based on what staff and service users have told us they want and also what we need to protect, promote independence and deliver positive outcomes for older people in our care. 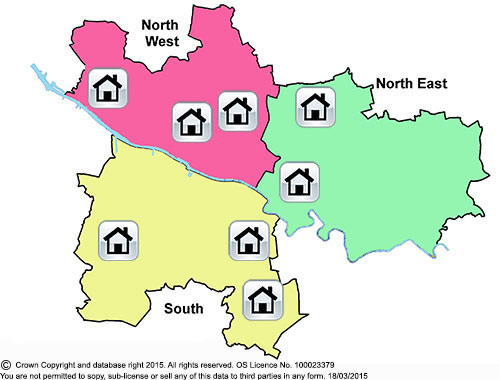 For information on the individual homes / day care centres then please either click on a house in the map below or use the links underneath. You can also read more information on the background and consultation for Tomorrow's Residential and Day Care.